Tucked amidst the rugged Hart Ranges of the Rocky Mountains, Pine Le Moray Provincial Park and Protected Area provides scenic splendor and a welcome retreat for visitors travelling the Hart Highway. Established as a Provincial Park in June 2000 with a Protected Area add-on in 2001, Pine Le Moray is a welcome addition to the Parks and Protected Areas of BC. The camping area is located adjacent to Heart Lake and is a picturesque and tranquil location. Try your luck for rainbow or brook trout as you paddle the smooth water or take a wilderness hike to the alpine. Please note: self propelled and electric motored boats only allowed on Heart Lake. No gas powered boats. This campground is cooperatively managed by a community, society or other partner. Services and facilities may differ from those offered in other BC Parks. There are no drinking water facilities in the park, please bring your own water. Pine Le Moray Provincial Park and Protected Area is located on the east and west slopes of the continental divide, 70 km southwest of Chetwynd and 50 km northeast of McLeod Lake. The park’s northern and northwestern boundary is adjacent to Highway 97 near Pine Pass. The park can also be accessed via a forest service road on the east side along Le Moray Creek. History: Between the years 1943 – 1945 surveyors laid out the route for what we now know as Highway 97, or the Hart Highway. During the fall of 1945 construction on the highway began. In 1950 Mount Le Moray Lodge was built in the Pine Pass; the lodge mainly catered to the travelling public and to the construction crews building, maintaining and eventually paving Highway 97. The improvements of this Highway greatly facilitated access into BC’s north country. Eventually, with increasing use, the pine pass area of the Highway became a popular destination for skiing, snowmobiling, fishing, hunting, and camping. 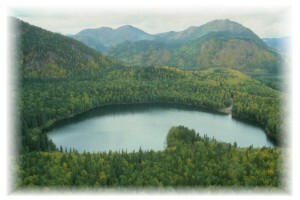 To accommodate some of the visitors to the area, a Forest Recreation site was established at Hart Lake. The popularity of the area for recreation and wildlife led to the area being designated for park and protected area status within the Dawson Creek LRMP in 2000 and the Mackenzie LRMP in 2001. Cultural Heritage: Area of traditional use by First Nations of the Treaty 8 Tribal Association. Conservation: The park and protected area protects the upper watersheds of Link Creek, Mountain Creek and Pine River. These areas contain representation of the wet, cool Engelmann Spruce-Subalpine Fir Biogeoclimatic Zone found within the Hart Ranges of the Rocky Mountains. Karst topography and significant alpine habitats are also preserved in this park. Wildlife: Caribou, moose, grizzly bear, black bear and wolverine all reside in or around the park. The Pine River and Link and Mountain Creeks contain several fish species such as bull trout, rainbow trout, arctic grayling, mountain whitefish and slimy sculpin. Cycling is permitted. Helmets are mandatory in British Columbia. Heart Lake is stocked with rainbow and brook trout. Anyone fishing or angling in British Columbia must have an appropriate licence. Please note: self propelled and electric motored boats only allowed on Heart Lake. No gas powered boats. There are no developed trails in this park. Please be experienced and safe when adventuring into the backcountry/wilderness areas. Horseback riding is permitted. Horses are not allowed in the campground and day-use area of Heart lake. The park is open to hunting. All hunters to the area should refer to the current BC Hunting and Trapping Regulation synopsis for more information. Swimming is available at Heart Lake. There are no lifeguards in provincial parks. There are winter recreation opportunities such as snowmobiling. Staff does not provide firewood. Campers may bring their own wood. The cutting of trees within the park is strictly prohibited. To preserve vegetation and ground cover, please don’t gather firewood from the area around your campsite or elsewhere in the park (this is a ticketable offence under the Park Act). Dead wood is an important habitat element for many plants and animals and it adds organic matter to the soil. Limited burning hours or campfire bans may be implemented. This park has a day-use/picnic area at Heart Lake. This park offers vehicle accessible campsites on a first-come, first-served basis – campsite reservations are not accepted. Campground is generally open on the Wednesday before the May long weekend to mid September. This is may change with earlier opening dates or later closing dates depending on weather. Please note: This campground is cooperatively managed by a community, society or other partner. Services and facilities may differ from those offered in other BC Parks.